This statement, made on behalf of Bonnier Publishing, is published in accordance with the UK Modern Slavery Act 2015 and sets out the steps that Bonnier Publishing has taken and is continuing to take to ensure that modern slavery or human trafficking is not taking place within our business or supply chain. We, at Bonnier Publishing, are committed to conducting our business to the highest ethical standards, with integrity and transparency to eliminate, as far as possible, the risk of modern slavery and human trafficking taking place within our business and supply chain. Bonnier Publishing is part of Bonnier Books AB which is a business of the privately owned Swedish media company Bonnier. Bonnier Publishing includes Kings Road Publishing, Igloo Books and Bonnier Zaffre. Bonnier Publishing is a leading publisher in both Children and Adult’s books and content. We, at Bonnier Publishing, recognise that our products have the potential to change lives and we are committed to producing them in ways that are both ethical and environmentally responsible, ensuring that what we do in no way harms, prejudices or enables people to be exploited. Bonnier Publishing works closely with manufacturing partners who share our CSR values, can demonstrate that they use sounds Quality Management Systems and employ ethical and environmentally sustainable business practices. We, Bonnier Publishing, have business relationships with approximately 35 suppliers with factories mainly across China and within Europe and the UK. All our suppliers must sign the Bonnier Code of Conduct which outlines the standards that Bonnier Publishing requires. We encourage a system of accountability and continuous improvement and regularly audit our suppliers to enforce our policies. We, at Bonnier Publishing, are members of the Publishers Resolution for Ethical International Manufacturing Standards (“PRELIMS”). All our suppliers have to commit to cover subject areas such as child labour, discipline, forced labour, discrimination, wages, hours, freedom of association and collective bargaining. They also include standards relating to health and safety and the environment. New suppliers are required to provide valid audits before we agree to engage with them. Our biggest exposure to Modern Slavery is within our global supply chain, we are constantly working with our suppliers to minimise the risk of Modern Slavery. All out suppliers and their factories are subject to due diligence checks in the form of compliance audits, if issues are identified, appropriate investigative and remedial action will be taken. 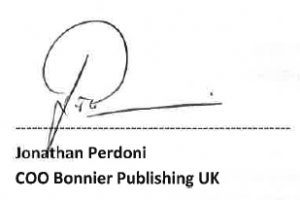 This statement was approved by the board of Bonnier Publishing UK.